My title reflects the theme of a breakout session at the fifth annual Rocky Mountain CitySummit held three weeks ago in Denver. The Summit is organized by the Downtown Denver Partnership and supported by a host of generous sponsors. It brings together local urban thought leaders and nationally famous keynote speakers. This year the latter included Bill Strickland, the visionary behind the Manchester Bidwell jobs training and community arts program that he originally founded in Pittsburgh, and Jeff Speck, author of The Walkable City. Other breakout sessions included the Bicycle City, Creative City, Healthy City, Sharing City, Next City, and Transformative City. How does a city become one that is inclusive of all? First it must address the growing divide between the rich and poor, the lack of affordable housing, relations between the community and law enforcement, and concerns about gentrification. This panel will discuss these emotionally charged topics and how community leaders are pushing for change to make their cities inclusive. Obviously this is a pretty tall order. Just how tall was illustrated by Minor Disturbance, a youth poetry slam group in Denver. 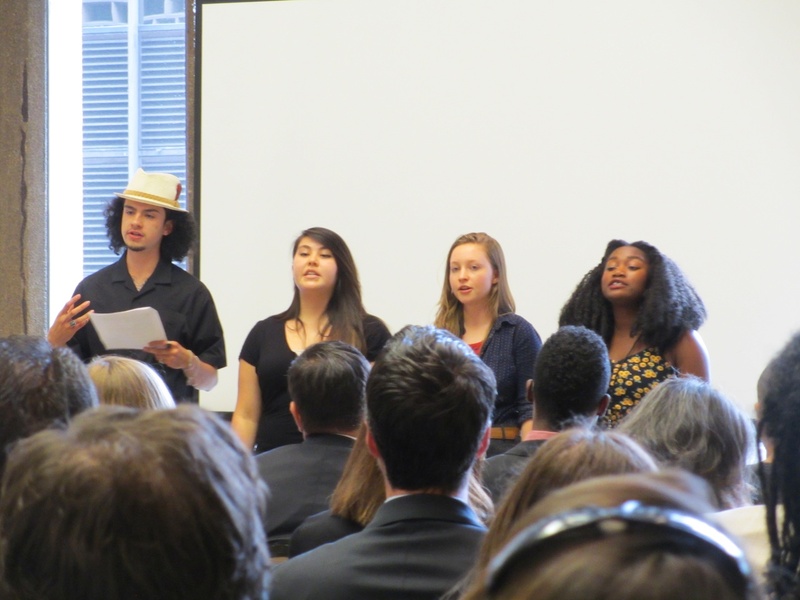 The young poets introduced the session with a sharp commentary about gentrification, income inequality, excessive police force, and the increasing invisibility—or at least the increasing segregation—of ethnic minorities in Denver. Session panelist Anthony Grimes, founder of the Denver Freedom Riders, channeled recent events in Ferguson to appeal for justice and rights for minority people. He urged us to ask who are “the people” that elected officials and public servants proclaim to serve. Javier Gonzales, the mayor of Santa Fe, New Mexico reported on efforts to secure the right to a living wage for working people in one of the Southwest’s most income divided cities. The topic of affordable housing was addressed by Kimball Crangle, Colorado Market president at Gorman & Company and former senior developer at the Denver Housing Authority. Crangle noted that the Mariposa neighborhood’s success as a diverse, affordable infill development turned on very aggressive community outreach that gave current residents a substantive voice in shaping the project. The session’s Q&A underscored the enormity of the challenges identified by panelists. Much discussion revolved around affordable housing; specifically, how to spread or “scatter” it around the city in a way that would allow resident populations to stay in place once wealthier folks begin moving in. Ms. Crangle mentioned that the redevelopment of Mariposa allowed 45 percent of residents to stay put, compared to the national average of 10 percent for these kinds of developments. We might ask whether even 45 percent is high enough. There was consensus that cities must “own” the issue of affordable housing, and that local developer and business communities must be “sold” on the economic argument for building inclusion. Mayor Gonzales noted how they’re trying to counter NIMBY-ism in Santa Fe by appealing to that city’s long history as a crossroads of interaction between different cultures beginning with indigenous peoples. Denver has the same kind of cultural heritage, but consciousness of that heritage doesn’t seem to be finding its way into the urban planning and policy discourse. Mayor Gonzales suggested that cultural institutions like museums could do more to draw diversity back to city centers beyond offering the occasional “free admission day.” For example, they might develop curricula and other forms of public outreach that better connect citizens to history and the arts. Anthony Grimes opined that “good business does what’s good for the community.” Others suggested that the business sector must be challenged to clarify “what it stands for” and to “look beyond the bottom line.” This echoed sentiments expressed at another affordable housing confab recently held in Denver. One audience member—a leader of the downtown business partnership in another Rocky Mountain city—summed things up by asserting that “we can’t policy our way out of this.” Instead, she called for nothing less than a revolution—in corporate boardrooms, state legislatures, city council chambers, and elsewhere—in how we think about inclusion. The conversation at the Inclusive City breakout session implicated, in a sense, some limitations of what Bill Strickland advocated in his Summit keynote speech: the locating of job training centers in underprivileged neighborhoods. It took only the span of a 15-minute coffee break for Denver financiers, developers, and architects to top off the funding required to build one of Mr. Strickland’s National Centers for Arts and Technology in Denver. This is undeniably a good thing. However, the bigger challenge remains of spreading affordable housing units and cultural institutions around the city in ways that might better “weave” different neighborhoods into a more inclusive whole. Or to borrow from Anthony Flint, they need to be “marbled” into the urban fabric. The problem is systemic and structural. Noblesse oblige will take us only so far. On the other hand, Mr. Strickland’s argument for creating “beautiful environments” that will allow talent and creativity to flourish is exactly on point. This is certainly important for schools, libraries, and job training centers. There are also lessons to be learned from other cities about what quality housing design can do for low-income residents and even wealthier adjacent neighborhoods. For example, David Baker’s projects in the Bay Area demonstrate how excellent design in affordable housing can not only uplift spirits and depress crime but also increase adjacent property values (see also here). Mr. Baker’s work was recently featured in a Denver Post op-ed by local architect Jeffrey Sheppard calling out the “banality” of downtown Denver’s new residential architecture, a landscape dominated by “repetitive five story wood apartment boxes.” It remains to be seen whether Mr. Sheppard’s critique will inspire a broader conversation in Denver about design quality and its social effects. In the meantime we have a few local, potentially iconic buildings that might serve as conceptual models. 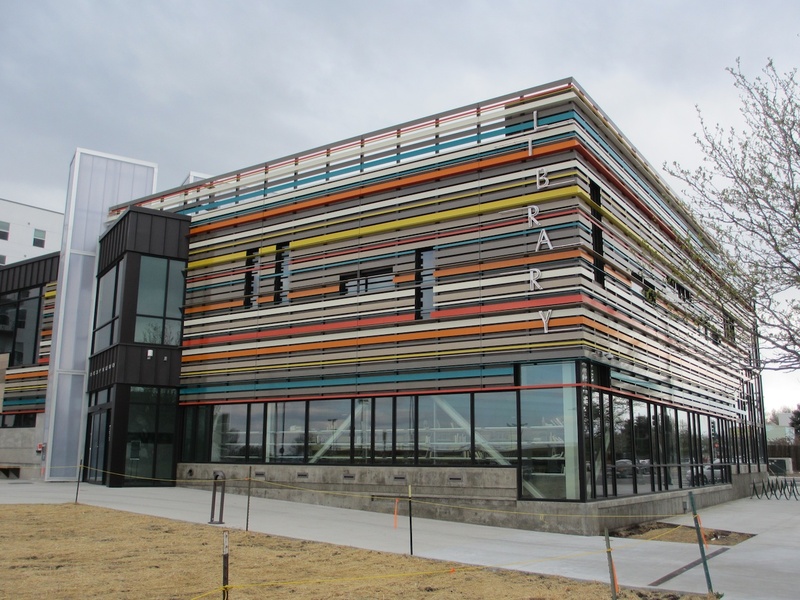 The colorful, aluminum-banded façade of the new Corky Gonzales Library by Studiotrope Design Collective symbolizes, for Denver Post art critic Ray Mark Rinaldi, the local neighborhood’s “threads of diversity that are woven into a unified communal fabric.” The “weaving” or “knitting” metaphors employed in these kinds of analyses are useful for conceptualizing the inclusive, intercultural city. They should be central to any broader conversation among planners and architects about what the Inclusive City might look like. The building has many other virtues: it is located to be maximally accessible to West Denver residents who rely on public transportation to get around, integrates program spaces for adults and kids so that they can remain within sight of each other, and resulted from a planning process that considered local census data and resident needs. Denver’s political and business elite routinely emphasize how “diversity” is valued in the city. However, it’s not always clear what kind of diversity is being referred to. From a design and development perspective, diversity seems to refer to the variable tastes of the Millennial generation that forms the target demographic for urban economic revitalization. We want to satisfy their penchant for Speck’s walkability, bikability, and a diverse array of unique shops and restaurants. We want to fulfill their wish for personal freedom to customize residential floor plans. We worry about what will happen when they start having children, and what we can do to keep their families in the urban core. We want the empty nesters among them to age in place. We don’t worry as much about serving different tastes in family size, composition, spatial form, and building and landscape aesthetics among the other cultural groups increasingly displaced and/or segregated by the Millennial migration. We assert the need for more affordable housing but usually fail to consider the kinds of affordable housing that might better appeal to ethnic minorities and that might pull them back to the city center. We talk multiculturalism, but we walk monoculturalism. In a recent issue of the journal Urban Studies, Miguel de Oliver notes how ethnic diversity is being redefined these days as a middle class amenity rather than a social justice ethic. Cities are strategically marketing cultural diversity as a way to “brand” themselves as tolerant and attractive to young, educated, upwardly mobile professionals. That is, cities are trumpeting their diversity as a way to create consumption opportunities and sell a lifestyle. It’s all part of cosmopolitan image-making or what the anthropologist Maree Pardy, in an unpublished paper described here, terms display. The consequences are increased investment in conditions that enhance business and services for the upper and middle classes, and associated neglect of what Pardy terms dwelling: the relations between people and the spaces they inhabit. Denver today is in many ways a site of display rather than a site of dwelling, especially if one considers the limited way we think about affordable housing and the built environment generally. Fran Tonkiss (cited by de Oliver) quite accurately characterizes the architectural outcome of an approach to building that’s predicated on display rather than dwelling. Tonkiss notes how the “mass production of gentrified spaces now creates…enclaves of visual and social sameness.” This describes Jeffrey Sheppard’s residential Denver to a tee. The stories that civic boosters and others tell about Denver and other American cities (e.g., here and here) are far too triumphal. These narratives very effectively “disappear” the people and issues that Minor Disturbance poeticized at the CitySummit. We need more self-critical urban analysis and less civic self-promotion. The distinctions made by Miguel de Oliver and Maree Pardy are important and compelling touchstones for any city building enterprise that views inclusion as a social equity imperative rather than just another civic branding opportunity. This essay was originally posted at Planetizen. I don’t know if people are aware of something happening with affordable housing in NYC. Builders of high priced housing are agreeing to include “affordable” units in their project but doing one of two things: either locating the affordable units at another site or, when the units are in the same structure, creating what is being referred to as a “poor door” for those tenants, so that they don’t come in contact with the occupants of the high priced units. It is becoming a joke, really, so feel free to laugh at the absurdity of it all.